Who says your decor just has to be flowers?! 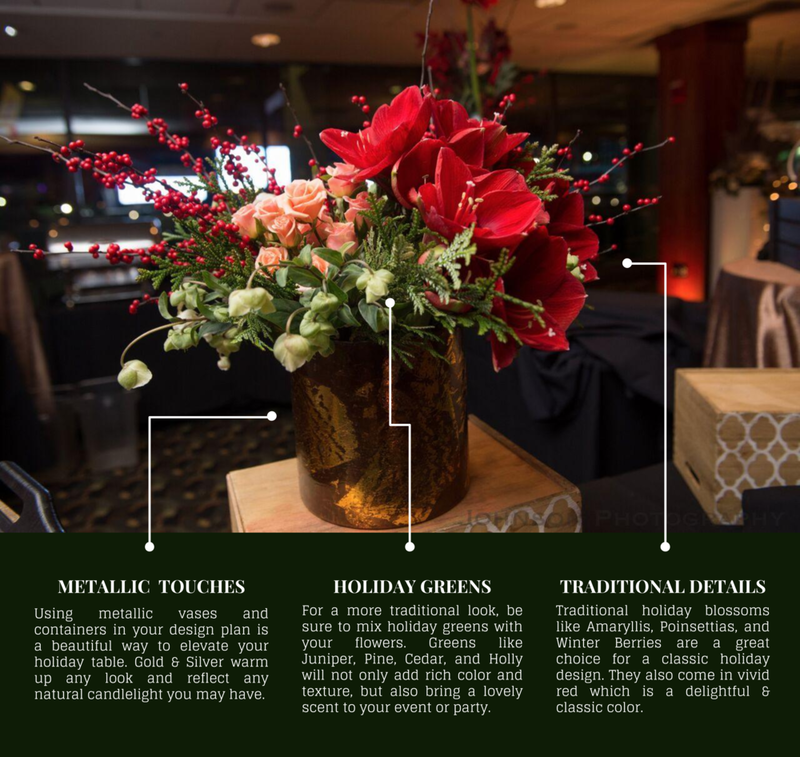 Incorporating other elements into your event, party, or wedding flowers can add an element of novelty or even elegance to the overall design. Elements like fruits and vegetables can tie your design plan together. They might hint towards a particular location. For example, lemons for a Mediterranean inspired event can add a fresh, bright pop of color and texture or Grapes for an event at a vineyard would pull in the surrounding landscape. 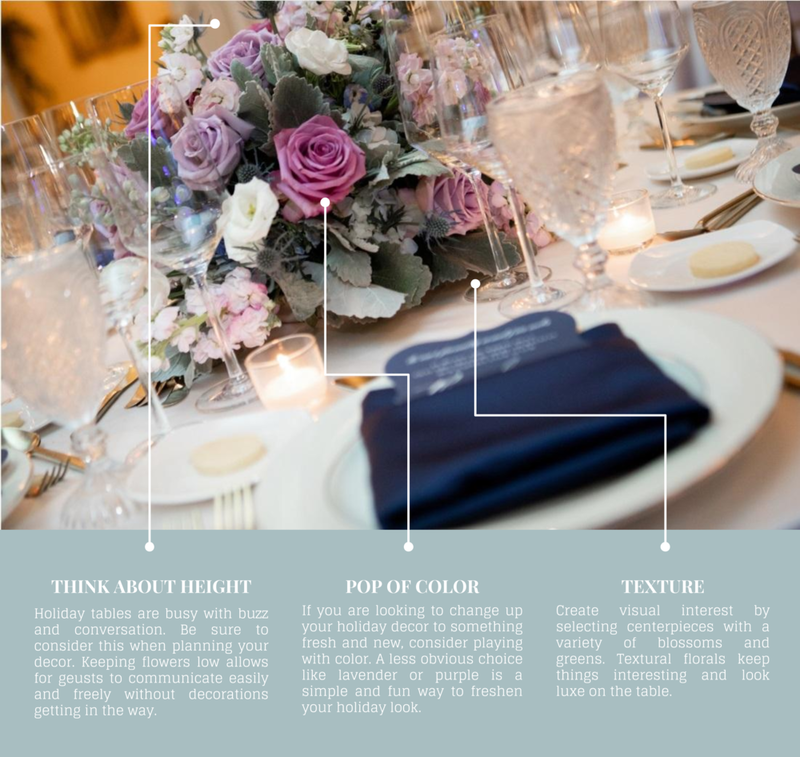 These additions may also ground the floral design in a particular theme. Mushrooms mixed with mosses, grasses, or twigs would create the feeling of a forest floor on the table for a rustic, outdoor themed wedding. Touches like berries or garden vegetables would be perfect for a sweet & refined garden party. In other ways, the addition of fruits and vegetables to a floral design may simply be sentimental or aesthetic. Your first date was at a wine-tasting? Grapes of course! You simply love the natural texture of an artichoke, go for it! Whatever your desire or inspiration the addition of fruits and vegetables may be an excellent and (delicious!) choice to incorporate into your overall design plan. Below, we have just a few of the many options to inspire you! A bright, bold pop of color and pattern can really elevate your event. For this table, an orange & aqua color palette gave a fresh feel to the table complemented by orange blossoms & metallic vases. The organic feel of the ivy & eucalyptus in the arrangements harmonized with the greenscape of the garden. Blush linen with ivory lace overlay is a beautiful combination for this table. Sweetly delicate, the understated palette pairs perfectly with the cream & pink florals. This design has a feminine feel accented by the textural lace detail. For this table, no-linens with a dark wood finish give a rustic vibe. Together, the long wooden tables and loose, organic florals feel rich & tuscan. 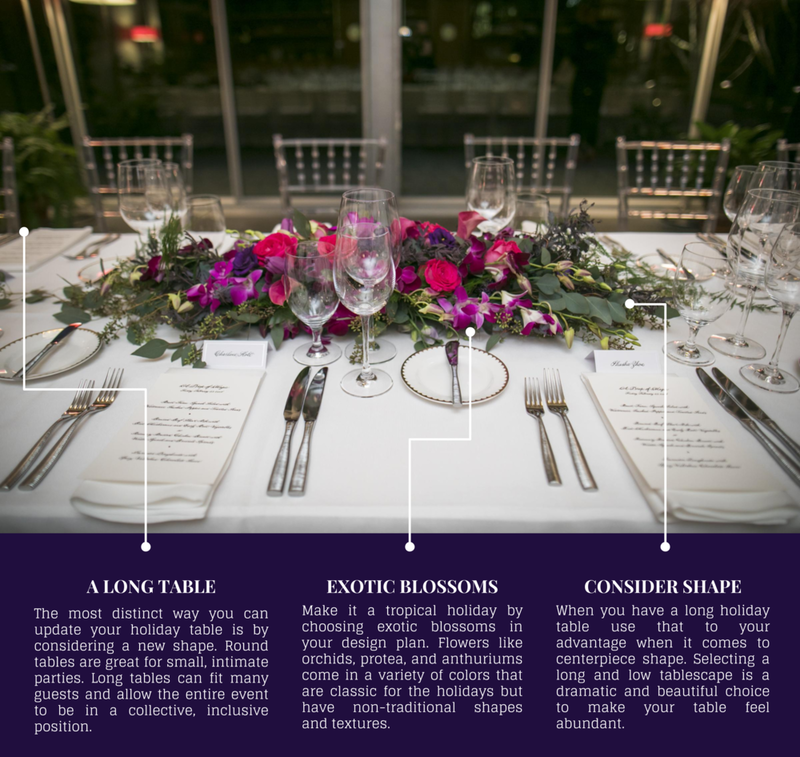 Clusters of olive leaves at each place setting only further the rustic Italian feel. This table is all about the linens. 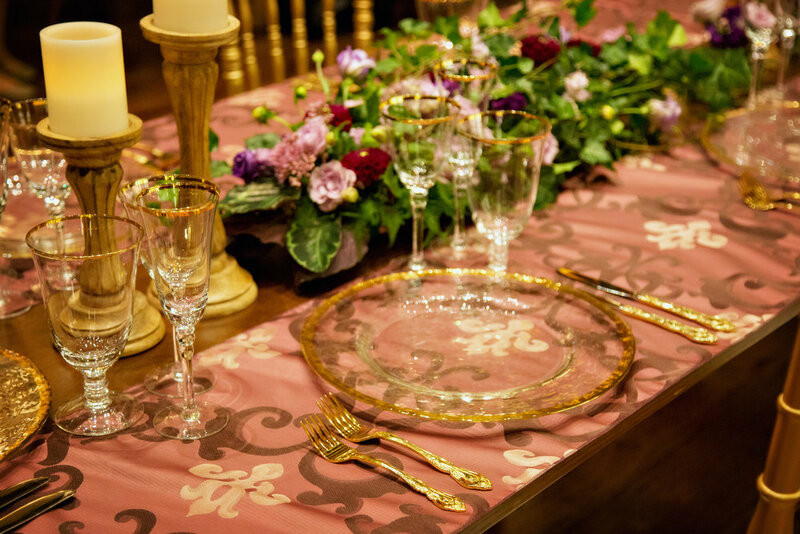 Rich plum runners with a damask pattern are the highlight of this table. To accentuate the runners, the flowers are kept in a similar moody plum palette accented by pillared candles that offer a soft glow. Touches of gold add a richness to the overall table.